Today, dear readers, I bring you the saga of dad and his rather wonky relationship with his hearing aids, and also the sad tale of going to a magnificent organ recital at Southwell Minster without being able to hear properly. Dad is fairly deaf. Without his hearing aids he is unable to hear much, but even with them we often find he cannot tell what we are saying. Sometimes he will sit and fiddle and pull them out of his ears, and the hearing aids will squeak and whine and drive everybody nuts except dad who cannot make out what we are moaning about. In the past he used to take them apart and try to fix them and was then unable to put them back together again, but his Alzheimer’s is so bad now that it no longer even occurs to him to attempt this. a) He has not put a battery in, or it has fallen out and he didn’t notice. b) The battery still has the sticky label on the back. c) The tubes in the hearing aids are blocked with wax. Sometimes it is simply a case of a dud battery, but dad no longer appears to hear or understand the diddly tune that the hearing aid plays to indicate that the battery is working. Last week I visited dad to take him for a walk with the dog and then waffles and maple syrup at the local coffee shop afterwards. When I arrived a rather puzzled looking staff member was trying to clean and adjust his hearing aids. Together we tried to prize off tubes, clear out wax, and find some batteries that actually appeared to work. This task was not helped by the fact that the box of spare batteries had magically disappeared. Meanwhile dad huffed and puffed around his room, unable to hear a word we said and unable to read the messages I tried to write down because he could not see. He looked for his ‘puffer’ – a rubber contraption that puffs air through the hearing aid tubes to clear them of wax and rubbish. I tried to indicate to him that I had already managed to clean the tubes but he was determined. The proverbial rock and the hard place would both disintegrate instantly if they encountered a dad-level of stubbornness. Eventually dad located the ‘puffer’ on his washbasin and shared with us that he has been filling it with water and squirting this into his ears to clean them! (Dad, along with his dementia and poor eyesight, is finding some intriguing new uses for things – for instance smoothing the bumps on his nose using his electric razor or rubbing toothpaste into his leg instead of his ulcer-prevention cream). Hearing aids sorted, dad was still unable to hear. We consulted one of the nursing team about checking his ears for wax and syringing them properly, but this had been done recently and was not safe to do on a frequent basis. We resigned ourselves to dad being completely deaf for the day and breathed a sigh of relief that the service appointment I had made at the hearing aid clinic happened to be the next day. So how did things pan out? Why, you might ask, did dad have to go to the organ concert four days later without his hearing aids? Well apparently the hearing aids work perfectly, but sadly dad was found to have a bad ear infection in both ears – no doubt exacerbated by using a ‘puffer’ as an impromptu syringe. 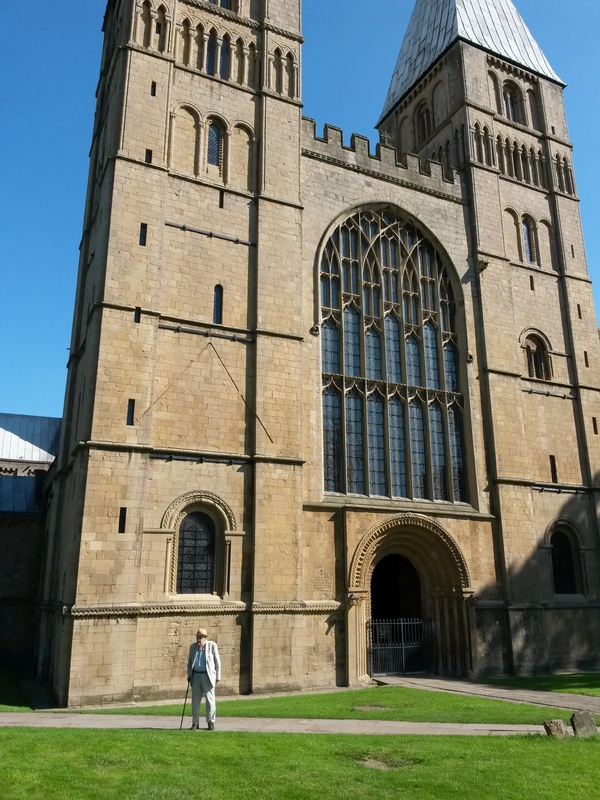 He was still under treatment for the infection when we did our trip to Southwell Minster (Matthew Martin’s organ playing was amazing, with a very interesting repertoire of pieces) and his hearing aids were soaking in sterilizing solution. Despite going hearing aid-less, dad could hold a level of conversation if I spoke loudly as I faced him – it was the infection that had rendered him unable to hear at all. What struck me most, though, was how absolutely helpless we were when dad found himself completely deaf. We could not communicate or reassure him at all because of his poor eyesight – he has recently been registered as Severely Sight Impaired – and because of his tendency to fixate on inappropriate things. It felt so sad seeing him flail around in distress seeking his own solutions and repeatedly asking ‘why can’t I have my hearing aids?’ It reminded me how important gentle reassurance and explanation can be for people like dad who are living with dementia. Hopefully by the time I see him next he will be back to normal – whatever that is in his dazzlingly different dementia universe – complete with hearing aids and pristinely clean ear canals. It has been a while since I posted a ‘mad moment’ so I shall cheat and borrow one from a few weeks back when I was ill with a viral bug and simply couldn’t stand up without fainting. I was crawling round the house and going to the loo was a trial. One time I could feel myself losing consciousness as I tried to reach the loo and the next moment I woke up on the floor with a broken toilet seat cover lying on top of me. The pain from the fall and the damage to my pelvis has been excruciating. It felt so surreal, just coming to after blacking out and finding myself there with the toilet cover and bruises all up my right side. Am very nervous of any feelings of dizziness now. Wonderful walk round the heathland and woods of Woolbeding Common during a visit to Sussex for a friend’s wedding anniversary do. Just drinking in the peace and watching the butterflies. The joy of being able to stand upright and go for short walks again!